Spitzer IRS (InfraRed Spectrometer) imaging of the outflow driven by the nearest, well-isolated protostar, IRAS 16253-2429. We have named this the Wasp-Waist Nebula, based on its IRAC appearance (the image to the right). The Wasp-Waist Nebula is unique in that the protostar's infall envelope is seen in absorption (the black areas surrounding the blue nebulosities) at mid-infrared wavelengths against the solid-state PAH (polycyclic aromatic hydrocarbon) emission from the surrounding molecular cloud. 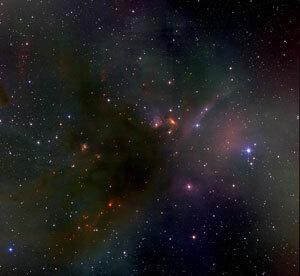 The properties of this protostar's infall envelope are also being studied. An investigation of the stellar and disk properties of a sample of close (a few hundred AU separation) pre-main-sequence binary/multiple systems via near-infrared spectroscopy and spatially resolved, ground-based, near-IR and mid-IR imaging photometry. This work will comprise the basis for SFSU graduate student, Rajasi Joshi's, M.Sc. thesis. 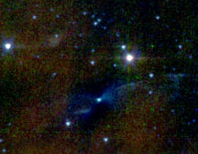 Search for free-floating, planetary-sized bodies in the ρ Ophiuchi clouds (shown to the right in near-infrared light), via narrowband methane filter imaging. These are the closest star-forming clouds to Earth, with the youngest embedded sources, when proto-planets are expected to be at their brightest. 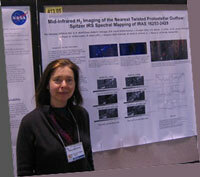 January 2009 meeting of the AAS in Long Beach, presenting results on the Wasp-Waist Nebula, shown below.